As the nationwide expansion of Google Fiber continues at a deliberate pace, the technology giant recently introduced Fiber Phone, a digital phone service option. While Google’s reasons for Fiber seem as much altruistic as competitive, enabling customers to bundle digital phone service along with Internet and TV makes perfect sense. Look no further than AT&T and Comcast, two companies also expanding their gigabit networks that typically offer bundles of the three major service offerings (Internet, TV, and Phone) to attract customers. If your location is on the shortlist for Google Fiber, perhaps bundling Fiber Phone makes sense for your monthly budget. Although Google hasn’t announced specific rollout plans yet, once “Phone” is added to existing Fiber markets, customers will be able to tack on the phone service to their existing package for an additional $10 per month. A glance at the feature list reveals a service not too different from Google Voice. 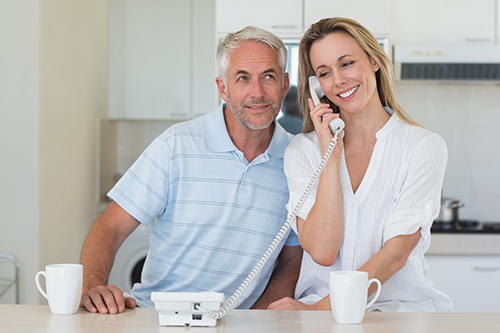 Most importantly, you will be able to use your current landline phone (no rotaries!) and phone number, although you can get a new number if you want. Other features include unlimited nationwide calling paired with inexpensive international rates, caller ID, call waiting, 911 service, and voicemail. The latter feature comes with transcription functionality that sends you a text or email of your messages. In short, it is a feature set typical of most digital phone services. You are also able to use Fiber Phone both at home and when you are out, as it is able to either ring your landline or mobile phone per your request. The Cloud-based service can even call your laptop or tablet if desired. This added connectivity is a boon for those always on the go. The Fiber Phone service comes with a small box-shaped device that resides next to your landline handset, similar to what’s provided by the digital phone over IP provider, Vonage. As noted earlier, Fiber Phone won’t automatically become available in current Fiber cities. If you want to be notified by Google when their phone service is available in your location, simply fill out this online form. The company also promises a simple and seamless installation process whenever you subscribe. Considering Fiber Phone shares many of same features as Google Voice, customers with the most interest in the service are probably current Fiber customers who get their landline service from another provider. Maybe Google is in it to win after all.